Most species of snakes are harmless. Relatively few people, at least in the United States, ever have personal encounters with snakes that pose a real threat to humans. Nonetheless, many Americans seem to have a major fear of snakes. Even otherwise manly men. In psychological parlance, it’s called ophidiophobia. 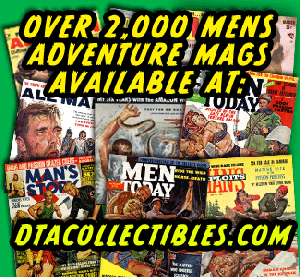 When I started collecting and studying men’s adventure magazines several years ago, I soon noticed that a significant number of issues have stories and artwork that seem to reflect our culture’s ophidiophobia. 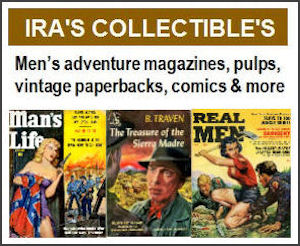 I’d estimate that over a hundred of the men’s pulp mag issues in my own collection have cover paintings with scary-looking snakes. And, there are many others that I don’t own (yet). I featured several classic examples in my previous post about “killer creature” covers. The covers shown in today’s post all feature snakes that are either big, or venomous, or both. One of my most recent acquisitions is the July 1957 issue of ADVENTURE LIFE, which has an awesome man vs. boa constrictor cover painting. It’s not credited or signed, but I think it’s by Mort Kunstler, who did a lot of animal attack artwork early in his career. Some other cool cover art with constrictor-type snakes (boas, pythons, anacondas, etc.) 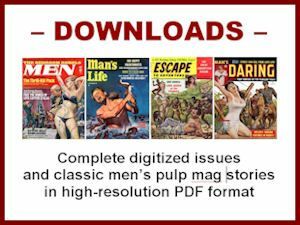 is featured on the cover of the September 1957 issue of MAN’S LIFE (painted by Wil Hulsey), the July 1956 issue of MEN (painted by Rafael DeSoto), and the December 1960 issue of PERIL (artist uncredited). 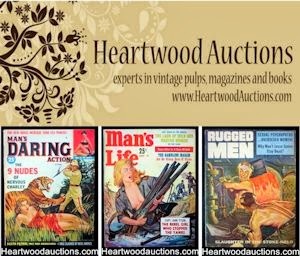 Several issues I bought recently have covers paintings featuring venomous snakes, such as the August 1957 issue of ADVENTURE (painted by Tom Beecham), the June 1959 issue of MAN’S SMASHING STORIES (artist uncredited) and the November 1956 issue of MAN'S LIFE (painted by Wil Hulsey). There’s also a subgenre of covers that manages to combine two kinds of images that were common on men’s post-WWII pulp adventure magazines — killer snakes and “Good Girl Art” (GGA) featuring bound damsels in distress. Often the torturers are primitive tribes, like on the cover of the October 1959 issue of CHAMPION FOR MEN (painting by Clarence Doore), the January 1961 issue of ESCAPE TO ADVENTURE (painting uncredited but recently IDed as a Clarence Doore illo by Thomas Clement, creator of the great American Art Archives site), and the October 1960 of REAL MEN (artist uncredited). In other cases, the bad guys that are using snakes to torment some bound babe or white guy are evil Commies or Arabs, like on the October 1961 of MEN IN CONFLICT (painted by Vic Prezio) or the June 1957 issue of RAGE FOR MEN (artist uncredited). For some reason, there seems to be a paucity of covers with Nazis using snakes to torture their victims. The only one I can think of as I write this post is one that I don’t have in my collection (yet), the June 1967 issue of MAN'S ADVENTURE. Maybe the Nazis were ophidiophobic. In contrast, as we all know from horror movies, Satanists are ophidiophilic. They love snakes as much as I love men’s pulp mags with snakes on their covers. One of my recently-purchased treasures is the April 1970 issue of MAN’S STORY. It has a very groovy Satanist snake-worship cover painting by an uncredited artist. The scene shows a bikinied blonde holding up a skull, while the next skull donor, two hissing cobras and some nicely-costumed Satanists look on. This illustration could conceivably go with several of the cover headlines. 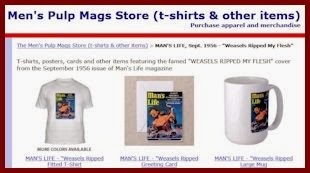 I like that one so much I recently used it to create a new set of t-shirts, sweatshirts, cards, posters and other unique collectors items in my MensPulpMags.com CafePress store. To check them out, click this link or the image below (which just shows a few of the “COBRA GODDESS” items).